A view of the frozen American Falls taken from Niagara Falls, Ont., on Wednesday shows the extent of the icing. If any single image could tell the story of Buffalo Niagara’s winter of 2013-14, this might be the one. After months of wrestling the mighty cataracts for supremacy at the brink, Jack Frost appears to be gaining the upper hand, sculpting a wall of ice that in some spots reaches three-fourths of the way up toward the brink of the falls. And its going to be even chillier throughout the region over the next few days. Temperatures, which will remain nearly 20 degrees colder than normal today, are forecast to drop below zero again tonight with a reinforcing shot of frigid air from the Arctic. Stir in a strong cold front that will arrive today to drop one to two inches of snow into winds gusting upwards of 45 mph, and it won’t feel one bit like the calendar is just two days removed from March. We’re not alone. The large trough of cold air has carved a huge “V” shape of subfreezing temperatures extending from central Montana down to St. Louis and up through coastal Maine. Tonight’s forecasted low of minus-2 in Buffalo has an “outside shot,” Hitchcock said, of catching the 80-year-old record low for the date of minus-4. Wind chills will likely range from 15 to 20 degrees below zero tonight. Don’t expect a warm-up anytime soon. It’s just the latest round of cold in a winter season that will continue a streak of four straight months of below-average temperatures. February’s mercury is running about 5 degrees below normal. January was 4.9 degrees colder than average. That followed December, 2.1 degrees, and November, 3.1 degrees below average. The sustained chilly weather is a testament to the strength of this year’s winter season, which got an early start with heavy snows in late November, a series of lake-effect snowstorms in December, the first blizzard in 21 years in January, followed by a 10-day string of low temperatures in the single digits or zero from Jan. 21-30. With a few exceptions – a day here or day there – February has followed suit. It’s why the Great Lakes have the greatest ice coverage they have had in two decades. More than 77 percent of the lakes’ water was covered with ice this week, including Lake Erie, which was 95.3 percent covered Wednesday, according to the Great Lakes Environmental Research Laboratory. 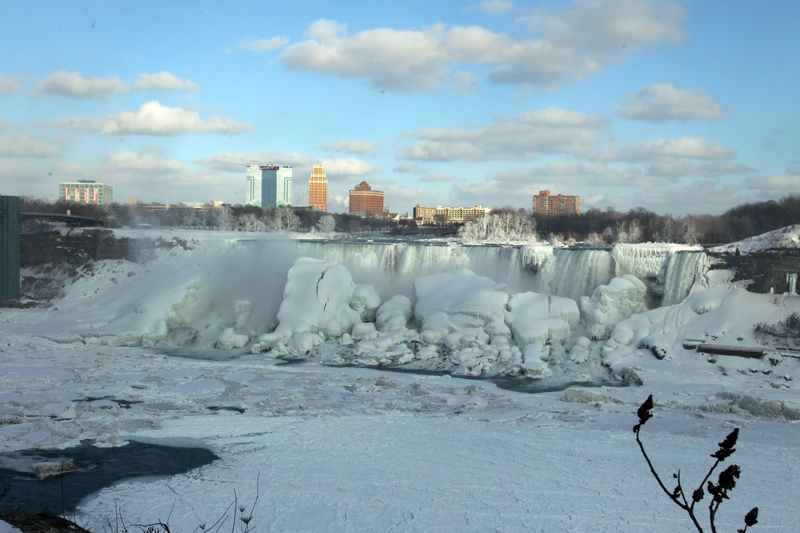 And it’s why Niagara Falls is appearing a lot more ice-crusted this year – albeit not “frozen over” despite some scattered national banter to that effect. Water is still pouring over the American Falls, but the view is becoming increasingly obscured by huge mountains of snow and ice that have risen skyward from the rocks at the base of the cataracts. The ice generated by the falls has presented a “particular challenge this year” for parks staff, explained Berti. Prospect Point has remained accessible but keeping ice off the walkways hasn’t been easy. Terrapin Point, Luna Island and the Three Sisters Islands are shut down as they are for winter. Locals call the ice buildup at and around the falls as much as they’ve seen in 15 to 20 years, Berti added. Snowfall will be one statistic to keep tabs on today, Hitchcock said.